The Muslim community expressed its outrage this week over a New York Police Department surveillance report from 2006 that the Associated Press reported on Monday. The report disclosed that the NYPD monitored Muslim Students Association (MSA) chapters in the Northeast. The outrage, centered on the perceived violation of privacy, is based on an incorrect presumption that law enforcement had no cause for concern with the MSA. The organization's history with radical dogma, convicted terrorists and radicalized alumni tell a different story. 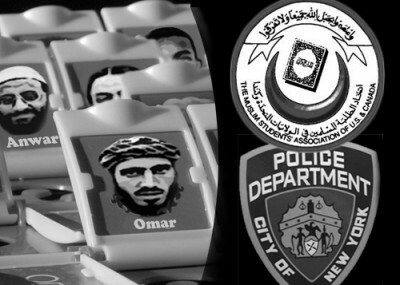 NYPD officials visited websites and forums of different MSAs and noted the posted information, all of which was in the public domain. No one hacked into any email accounts or sites as part of the surveillance. A separate story reports that an undercover officer attended a rafting trip with more than a dozen MSA members. But NYPD officials say critics are off base when they claim the department did something wrong. "There is no constitutional prohibition against a police department collecting information," city senior counsel Peter Farrell told reporters Thursday. "What's unconstitutional is if they then use that information to chill someone's First Amendment rights or to impose harm on them." The AP report chronicles different events that some MSAs held and speakers that chapters hosted on campus and provides some lists of event attendees. The surveillance was intended to track any potential radical speakers or behaviors of the different chapters or individual members. The report lists six different incidents of monitoring in 2006 at the University of Buffalo, New York University, and Rutgers University. It also lists 12 other MSAs that were tracked, but did not provide "significant information posted to their web sites, forums, blogs and groups." "Some of the most dangerous Western Al Qaeda-linked/inspired terrorists since 9/11 were radicalized and/or recruited at universities in MSAs," NYPD spokesman Paul Browne said as an explanation for the surveillance. "We were focused on radicalization and/or recruitment, specifically by groups like Al Muhajiroun, Islamic Thinkers Society, Revolution Muslim and others." Criticism of the NYPD surveillance has been swift. "We believe that the NYPD clearly overstepped its boundaries when it began spying on average American Muslim college students who were simply taking whitewater rafting trips or innocently participating in school activities at their college or university campus," said MSA National President Zahir Latheef. "University officials may be the last line of defense for Muslim students whose rights were apparently violated by the clearly unconstitutional -- and possibly illegal -- tactics used by the NYPD," Council on American-Islamic Relations (CAIR) spokesperson Ibrahim Hooper said. "The NYPD continues to act as if it is somehow above the law that governs all other individuals and institutions." Cyrus McGoldrick of CAIR- NY said, "It's very clear that this is not about police work this is about monitoring people based on ideology." "They're just going out and casting a wide net around a whole community, so they're criminalizing in a way a whole community based on their religion," said CAIR-Connecticut Director Mongi Dhaouadi. The Rutgers MSA called on the community to "openly condemn the clear violations of the NYPD, who conducted illegitimate profiling outside of their jurisdiction and breached the constitutional rights of an individual." The NYPD has a duty to protect New York City from terrorist attacks. And MSA leaders and members have been convicted of terrorist activities and plots. MSA was founded in the United States in 1963 by members of the Egyptian-based Muslim Brotherhood. The Brotherhood seeks a global Islamic state and has spawned leaders of a series of Sunni terrorist groups, including al-Qaida, Hamas and the Palestinian Islamic Jihad. The Muslim Brotherhood motto established by founder Hassan al-Banna is, "God is our objective, the Quran is our Constitution, the Prophet is our leader, jihad is our way, and death for the sake of God is the highest of our aspirations." MSA members remain faithful to Brotherhood ideology. At the closing session of the MSA West conference in January 2011 at UCLA, attendees recited a pledge, "Allah is my lord, Islam is my life, the Quran is my guide, the Sunna is my practice, Jihad is my spirit, righteousness is my character, paradise is my goal. I enjoin what is right, I forbid what is wrong, I will fight against oppression, and I will die to establish Islam." One student attracted NYPD scrutiny in 2006, the AP report said, after forwarding a promotional posting about a conference in Toronto featuring "highly respected scholars." For example, Siraj Wahhaj is a radical imam who was listed as a possible unindicted coconspirator in the 1993 World Trade Center bombing prosecution. During remarks given at his Al-Taqwah mosque in 1995, Wahhaj blasted America as "a garbage can. It's filthy, filthy and sick. This country is taking our children. We're trying to raise them up righteous. And you with your sick, low morals grabbing them, trying to teach a man how to be respectful towards his wife. And you got perversity all over. Wicked filth everywhere." Zaid Shakir is lauded by some as a moderate Muslim voice, but his speeches and writing show that he believes America poses "the single greatest threat to world peace." He has suggested the FBI was involved in the 1993 World Trade Center bombing and decried "glaring weaknesses and inconsistencies in the official narrative" about the 9/11 attacks. Hamza Yusuf is a founder of the Zaytuna College in California who has called America "one of the most virulent kufars [infidels] that has ever attacked the social body" and says that he believes American culture "revels in" war and violence. Another speaker, Tariq Ramadan, is the grandson of Muslim Brotherhood founder Hassan al-Banna. He was barred from entering the United States at the time of the conference due to concerns he supported a charity tied to Hamas. The AP report does allude to Wahhaj's past, noting that he "has attracted the attention of authorities for years." But it offers no context or background on Shakir and Yusuf, simply telling readers that they are "two of the nation's most prominent Muslim scholars." The Toronto conference previously attracted government concern. The U.S. Bureau of Customs and Border Protection (CBP) had "reason to believe that certain individuals who were associated with terrorist organizations or activities might pose a danger to the Unites States, or who were associated with organizations that provide financial support to terrorists, would be in attendance at the 2004 RIS conference," a Second Circuit Court of Appeals decision said. CBP was also concerned that the conference "would serve as a possible meeting point for terrorists." Last May, the MSA chapter at the University of California, Irvine (known there as the Muslim Student Union or MSU), hosted an event with Amir Mertaban who is a former president of MSA West. During a 2007 conference, Mertaban urged students not to "ever compromise on your Muslim brothers and sisters in which you have no evidence. Osama bin Laden- I don't know this guy. I don't know what he did. I don't know what he said. I don't know what happened. But we defend Muslim brothers and we defend our Muslim sisters to the end. Is that clear?" That didn't mean people should support terror, he said, but they should never compromise on their faith "Because Islam is a perfect religion." Invited back in 2011, Mertaban admitted to having supported the Taliban in the 1980s, and refused to condemn the terrorist organization Hamas, claiming that it has done a lot of good in terms of social and political programming. In a subsequent interview with the Investigative Project on Terrorism, Mertaban emphasized that he does not know if Osama bin Laden was responsible for 9/11, refused to recognize Israel as a sovereign nation and said he supports Hamas "freedom fighting missions." MSA's history and various connections are significant in evaluating the NYPD's surveillance. Mayor Michael Bloomberg defended the action as an important countermeasure to terrorist activity. "Of course, we're going to look at anything that's publicly available, in the public domain. We have an obligation to do so," he said. NYPD spokesman Paul Browne added that "[s]tudents who advertised events or sent emails about regular events should not be worried about a terrorism file being kept on them. NYPD only investigated persons who we had reasonable suspicion to believe might be involved in unlawful activities." One student who was on the rafting trip understood this. The AP quoted Ali Ahmed saying the NYPD was doing its job. "There's lots of Muslims doing some bad things and it gives a bad name to all of us," he said, "so they have to take their due diligence." If Ahmed's views represented the MSA, rather than the radical ideas and actions of past leaders, NYPD would lose interest much faster. Elizabeth, the KKK and other groups are investigated, they just aren't getting the press coverage as the Muslim Brotherhood groups are. No hypocrisy, just no coverage. Why are the KKK's activities not investigated as much as the MSA's? I think it is absurd for you to believe that you know what is or is not Constitutional better than SCOTUS. But, I also think that as long as they are not infringing on an individuals rights, the NYPD has the authority and obligation to monitor any group that it suspects of being dangerous or of having dangerous members. Hence, the surveillance is entirely acceptable, as long as that is as far as it went. It is shameful that after two centuries, Americans in general (and the American press in particular) fail to understand the limits of Fourth Amendment protection. The right to be safe in one's person, house, papers, and effects does NOT extend to public spaces, nor, as the Supreme Court has ruled, to one's vehicle. Any other person or entity is not constitutionally prohibited from surveillance and information-gathering activities within those unprotected places. Therefore, the senior counsel is entirely correct when he says there is no prohibition against the police lawfully gathering information, so long as it does not infringe Fourth Amendment rights. It is ridiculous and unreasonable to castigate a law enforcement agency for doing its job in a lawful manner. If the people in under investigation had had ties to the Mafia, there would have been no questions, no protests, and no story. But this flap may have one beneficial effect, if policy-makers decide to take the hint: it is high time that local, state, and federal governments stated unequivocally that terrorism is a crime, terrorists are criminals, and terrorist organizations are criminal organizations. NYPD officials should treat these ridiculous allegations by MSA and CAIR with the contempt they deserve--and not deign to reply to them.